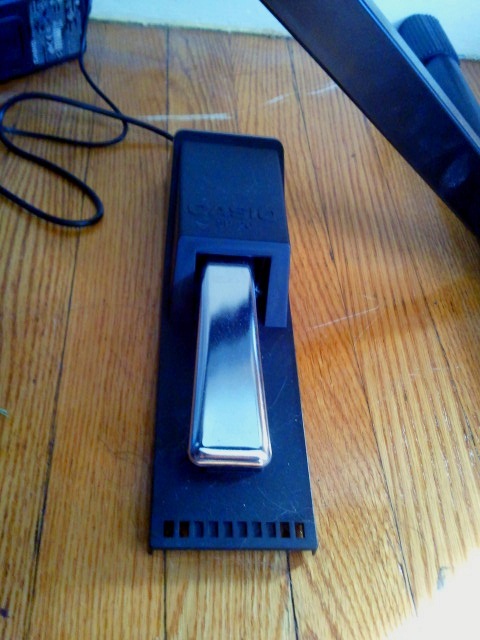 The Casio SP-20 Piano Style Sustain Pedal is a sturdy replacement to be used with any Casio product. I was given this item as a gift to replace the plastic pedal that came with my Casio CDP- 120. The original small plastic box-like pedal slid around on the floor, and was just not really good underfoot. It really felt unnatural and “clicky”. The Casio SP-20 pedal is weighted, stays in place, and feels much closer to a real sustain or damper pedal on a piano. The sound is not bad. There are times when I feel like I don’t hear much of an effect when I am pressing on the pedal, but I have to remember that this isn’t a real pedal on a real piano with strings. Although not perfect, it definitely helps to improve the overall immersion into the feel of playing a real piano when you are forced to use a weighted key substitute because of space or portability restrictions. The pedal is still a small and lightweight unit so it would be fine to add to any touring rig. It is also made up of pretty solid construction, so it should easily weather the abuse of the constant packing and unpacking, as well as the kicking around underfoot on stage. And for under $30.00 US it is not that hard to replace if you manage to break one. In general it does a pretty good job, feels much more realistic, and accomplishes its primary goal of not sliding around when I’m trying to use it. I would recommend this as a replacement for any of the less realistic sustain pedals that come packaged with keyboards, and you might want to consider including the Casio SP-20 pedal with your original purchase. I purchased a CDP-120 back in Oct 2012. I like it for basically the same reasons you’ve stated in your articles, although for me being able to use headphones is a major factor. Regarding the sustain pedal, I bought an M-Gear Sustain Pedal from Amazon which is probably similar to the one you got. From what I’ve experienced, the sustain is weak and more like a half-damper than a full damper. When playing, I can get away with just holding the damper pedal down continuously and it sounds find. The problem is is that when I switch to real piano, it sounds like mush because I have not developed good pedaling technique because the weak sustain allows me to slack off on pedaling. Can you tell me if you’re experienced the same thing? Thanks, for the feed back. I think what helps is me to occasionally play the songs I learn on the CDP-120 on an acoustic piano.